Deep in the archives of the Massachusetts Historical Society, in Box 22 of the William Hickling Prescott papers, is a folder called “Notes in Spanish.” Inside the folder is a collection of manuscripts, written in a variety of hands. A scrap of paper containing a list of common Latin phrases. A list of “libros comprados en Londres”. A copy of a catalogue page listing items pertaining to Felipe II from the Biblioteca Publica de La Haya (The Hague Public Library). William Hickling Prescott (1796-1859) was a U.S. historian famous for his carefully cited histories of Spain, Mexico, and Peru. Though a food fight-related accident in his youth left him nearly blind, Prescott worked closely with assistants and collaborators in Mexico, Spain, the U.S., and England to acquire (and, presumably, read) archival documents related to his chosen subjects. His thorough use of original sources, combined with an energetic narrative style, made him arguably the first U.S. historian to gain international renown. Given Prescott’s extensive work on imperial Spain, the folder marked “Notes in Spanish” already poses a kind of categorical problem. What approach to cataloguing would make “Spanish” a meaningful organizational category for archival materials? What kind of researcher would arrive at the Prescott archive and say: I’d like to see everything written in Spanish? Given the presence of Latin documents in the folder, we might suspect that whoever organized these materials (perhaps in the nineteenth century) didn’t read Spanish at all. They may have simply used this folder to offload impenetrable texts. Copy of the autograph of Hernan Cortes, from the Prescott manuscript collection at the Massachusetts Historical Society. Tucked away in this collection of miscellany is a copy of the signature of Hernan Cortés, the Spanish conquistador who led the attack on the Aztec city of Tenochtitlan. The signature is on tracing paper that has been affixed to a piece of paper. It was glued upside down, so that the signature reads from right to left. 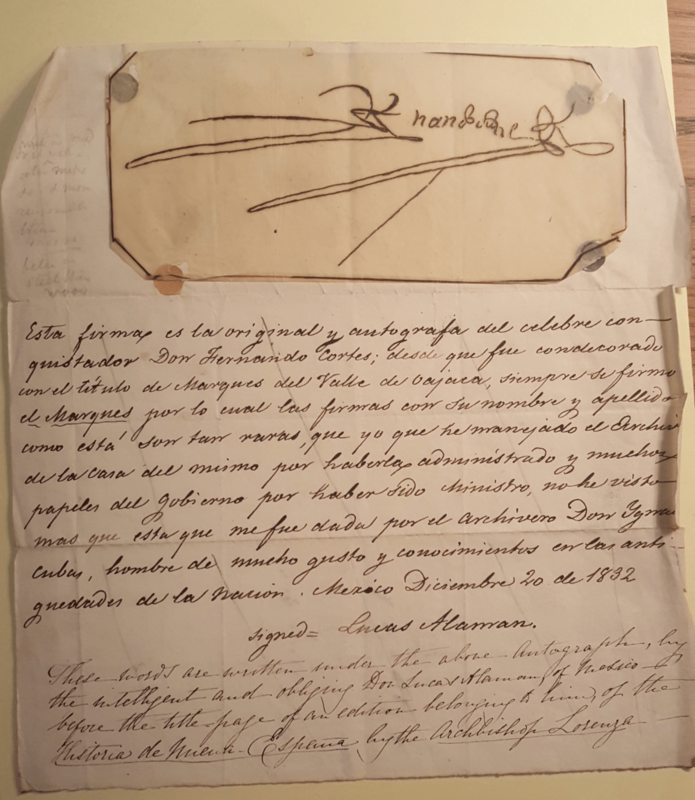 A note beneath the signature, signed in its turn by the Mexican historian Lucas Alamán (whose papers are at the Benson Latin American Collection), assures us that “Esta firma es la original y autografa del celebre conquistador Don Hernando Cortes” (This is the original and handwritten signature of the celebrated conquistador Don Hernando Cortes). Signatures upon signatures upon signatures. Why did the nearly-blind Prescott want a copy of the signature of Hernan Cortés? What value does a signature copied from a printed book carry? Why authorize the signature twice, once in Mexican Spanish, again in English? Autographmania — society’s fascination with, and collection of, autographs — has a long history in Europe, where it dates back to the sixteenth century; in the United States, it became a fad in the early nineteenth century. Collectors would gather the autographs of friends, family, and public figures (both celebrated and unsavory); important figures of American history, like those whose signatures graced the Declaration of Independence, were also popular. Graphologists like Edgar Allen Poe (writing, perhaps, in a spirit of public ridicule) might analyze these inscriptions to come closer to understanding the writer’s personality. But what of the Cortés signature? Perhaps Prescott hoped to identify some personal qualities of the man in the curves and twists and jagged edges of the reproduction. Perhaps, by bringing the signature into his collection, he hoped to bring Cortés more closely into the North American sphere, along with the murderers, poets, and founding fathers whose signatures were so popular. Perhaps, in some symbolic way, wielding the signature of Cortés affirmed the authority and authenticity of Prescott’s biography of the conquistador. Yet surely something erodes in the triplicate copying of the autograph, in the double-framing of its authenticity. We often go to archives hoping to access an authentic historical record: to touch the pages that were touched by history, to come face to face with a historical moment. In the analysis of hand-written documents — the decoding of paleographic text — we seek to insert ourselves into that moment of inscription; as Arlette Farge writes, it is “As if the hand, by reproducing written syllables, archaic words, and syntax of a century long past, could insert itself into that time.” Yet many of the documents we find in the archives are framed by the mechanisms of reorganization and reproduction. What past does the replication of this handwriting bring us closer to?